The Rogers State men’s basketball team appears to be every team’s worst nightmare in the Sooner Athletic Conference. Big upsets and close niched victories have bumped the Hillcats into the No. 25 nationally ranked slot in the NAIA. Looking back at the schedule, the Hillcats have certainly made a 360 degree turn around. According to preseason polls RSU is picked to finish seventh in the SAC. Likewise, the first half of the season seemed to look that way for the Hillcats. RSU men closed out 2010 with an overall record of 5-9 and a conference record of 1-3, dropping both games to John Brown and one game to Oklahoma Christian. 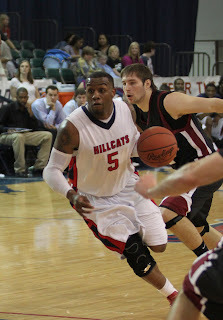 However, the Hillcats found an unexpected surge of energy in the 2011 conference play. Since Jan. 1 the Hillcats have improved to 13-3 sharing the No.2 seat in the SAC with Southern Nazarene. “We feel like we’re playing better basketball at the right time of the year,” said RSU men’s head coach Justin Barkley. After a 10-day break due to inclement weather, the Cats are coming off a six game winning streak including upsets over nationally ranked No. 15 in the senior night game against SNU and the rescheduled game win against No. 10 Oklahoma Baptist. During their six-game stint, senior guard Deveric Taylor joined the 1000 point club in the win against Oklahoma City finishing the game with 18 points and 1007 career points. The Dallas, Texas native is having his best shooting season out of his three year tenure at Rogers State. He’s averaging 16.5 points a night, shooting 44.3% in field goal range and 34.1% beyond the arc. In the victories against SNU, Mid-American Christian, and University of Science & Arts of Oklahoma, senior power forward John Boyd earned SAC Player of Week for Feb. 14-20. The Wagoner, Okla., native averaged 20 points and 6.7 rebounds during the three-game week shooting 61% from the field and 79% from the free throw line. Boyd also had seven assists, six steals and three blocked shots for the week. He is the first player on the men’s team to receive player of the week accolades this season. Unfortunately, there’s little room for celebration. Heading into the post season, the Hillcats are focused on keeping their minds on what’s at stake. “I think everybody on the team believe we can make it to the national tournament and finish top two in the conference so it’s a big achievement for us,” said senior guard Chris Francis. The SAC Conference Tournament is set for Mar. 3-5 in Oklahoma City, Okla. The NAIA National Tournament will be held March 16-22 in Kansas City, Mo.